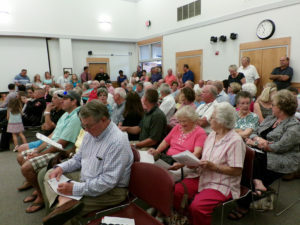 Over 100 people packed into the Smithfield Town Hall Tuesday evening for a public hearing on a controversial request for a private club in South Smithfield. Tony Baldovinos of Fuquay Varina submitted plans for the Baldovinos Event Space, a private club proposed at 3460 South Brightleaf Boulevard adjacent to Holt’s Lake Barbecue and Seafood. Plans included a 9,200 square foot event center and 108 parking spaces on a 2.17 acre lot close to many residential properties. Jared Matthews of The Curry Engineering Group of Fuquay Varina appeared on behalf of the applicant, he said because of a language barrier. Matthews said plans included the demolition of a current brick house on the property and the construction of the event center with a 6,200 square foot open floor area and stage. He said plans were to rent the facility for weddings, birthday parties, Rotary Club meetings, Women’s Club meetings and similar functions. However, in case the event center was not profitable, the applicant also wanted permission to operate a club on the premises with an ABC permit to serve alcohol. Town staff said the club could accommodate as many as 324 people if seating were provided. If no seats were provided, the club could accommodate up to 1,100 people. A 30 foot by 30 foot outdoor patio was also requested. Matthew said at least one security guard would be on duty anytime an event was held. Planning Director Stephen Wensman said the lot was already zoned for business use and a public hearing would not have been required had the applicant not requested an ABC permit. Councilmen questioned Wensman about the difference between an event center and private club and how it could be monitored by police. Because the club would have been private, police would not have the authority to go into the club and monitor it for any violations. A total of nine people spoke during the public hearing against the business expressing concerns about noise, traffic, lightning, and the hours of operation. Dr. Dennis Koffer presented a petition from the Homeowners Association of Lake Park Circle. The petition was signed by 62 people opposed to the club. Smithfield Mayor Andy Moore expressed concern the business would not be in harmony with surrounding properties. Councilman Emery Ashley expressed concern about what the business, if approved, would be like in 1, 5 or even 10 years from now. After Matthews said the business might one day be an upscale restaurant that served alcohol, Councilman Ashley expressed his concern to Matthews about the lack of an actual plan, saying nothing was in the application about a restaurant. 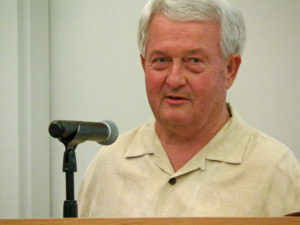 Four Oaks Mayor Linwood Parker was one of the 9 people to speak against the business. Parker said the Holt’s Lake area has seen tremendous residential growth in the last 30 years and questioned if the club was the highest and best use of the land. “Is it really needed,” Mayor Parker asked. “Most all the problems today come from bad government decisions 30 years ago.” He asked Smithfield council members not to make a bad decision. Parker reminded the town council that his wife was hit head on in Smithfield by a drunk driver in the wrong lane on US301 in 2017. The driver had just left from a similar event center. Former school board member and local businessman Kay Carroll was the final speaker during the hearing. Carroll said the applicant would not be able to recoup a $1 million investment by renting out the Event Center for weddings, rotary clubs and a women’s club. Carroll said to get the money back it would have to operate as a club and sell alcohol. “It is not the place for that. It is not appropriate and safe for the area. It is not building the Smithfield community up and attracting growth.” Carroll said it would also impact surrounding property owners because the club would likely operate to 2 or 3am in the morning. Following the conclusion of the 90 minute public hearing, the council voted unanimously to reject the request.